The text below is from a recent interview I gave on stained glass for a website that features information on taking up the craft as a hobby. KM: Richard, thanks for joining us from the Stained Glass Association of America. What exactly is the SGAA? RG: The Stained Glass Association of America is a more-than 100 year old trade association for professional stained, decorative, and architectural art glass artists. We provide education and advocacy for the craft and its practitioners, as well as publish a magazine called The Stained Glass Quarterly, which covers both contemporary and historic stained glass in the United States and around the world. KM: At Knox Makers, we delve into a Stained Glass 101 workshop in November. Do you have any advice for those looking to get started in stained glass? SGAA: Don’t spend too much on tools and glass until you cut yourself for the first time. Also, take time to learn the fundamentals of structure. Not every cut that can be made should be made. Stained glass has a certain inherent beauty because of the material from which it is made; however, if structure or technique is lacking then the finished piece will not endure. KM: There is a growing trend of DIY groups popping up such as Makerspaces and Hackerspaces, where art and technology share common ground in shared spaces and learning environments. How do you see stained glass fitting into these DIY cultures? RG: Stained glass is very much a hands-on craft and the basics of craft technique haven’t changed a lot in a very long time. There are more electric tools being used today, of course, and there is a wider variety of tools and materials from which to select. The problem in learning stained glass has always been finding training. Many of the craft techniques can be very effectively taught through new technologies that allow more interaction and allow the use of video and animation to teach craft skills. KM: Many interesting projects seem to be popping up lately where different crafts, skills, sciences, and materials are joined together in unique ways. How do you see stained glass as a craft and as a material fitting in with these type of projects? RG: There has been some very exciting application made recently of solar panels incorporated into stained glass installations. The fusing of an art that relies on the sun with a green energy technology that provides electricity from sunlight is something that has almost limitless room for exploration. I expect there will be a lot happening on that front over the next several decades. Also, new techniques such as laminating and fusing are becoming more widely used in architectural stained glass, many of which are giving a whole new look to what people can produce in glass. KM: Alright, so walk me through the history of stained glass. How did it get started, and how has it evolved? RG: The origin of stained glass as an architectural art is very much obscured by the mist of antiquity. We know that the oldest known fragments of a true stained glass window are about 1500 years old, but this was a developed window. The fragments indicate an already fairly developed craft technique. So, stained glass itself must date back farther even than that. We know that in first-century Rome, they were glazing building openings with glass. We also know that the glass itself was not very transparent and tended to distort the view quite a bit. It would make sense that stained glass would have developed quickly at this time; the materials and the need were in place. Romans wanted to cover window opening with glass; it was far easier for them to make multiple small pieces of glass and bind them together with lead. From that, it is a very short step to making designs with the colors, textures, and lead, thus giving actual stained glass windows. The history of stained glass as an art is very interesting and is full of the ebbs and flows that one sees in most any art with an ancient pedigree. The history of stained glass as a craft is somewhat shorter; frankly, not a lot has changed – or, at the very least, has to change – in the way a stained glass window is made. Sure; on the one hand you could make the argument that sheets of art glass today can be cut by computer-controlled water jet, and that’s valid. But, on the other hand, most glass for stained glass is still cut by hand by a skilled craftsperson; it’s glazed into a window using lead, which is traditional, or copper foil, which has been in use for a little more than 100 years; it is waterproofed and reinforced; and it is installed in an opening. It’s all very much a hands-on thing. Glass cutters today are generally metal or plastic tools with a steel wheel that scores the glass; before the industrial revolution, diamond-tipped styluses were used to score the glass; before that, an iron poker was heated and used to score the glass. Still, you could take a craftsman from a thousand years ago into today’s studio, show him how to use the modern cutter, and he would quickly be up to speed on cutting glass. He’d find today’s plug-in soldering irons and steel wheel cutters incredibly useful, but not all that different from the tools he used in antiquity. KM: What will be the profile of the stained glass customer in the future? RG: Look for an expansion of stained glass in private residences as people look for more ways to add art to their homes and to make them more unique. Catholic and mainline Protestant churches will continue to use stained glass in their buildings; there will probably be an expansion in the use of stained glass installed in light boxes in churches instead of in traditional window openings so that the stained glass can be illuminated when desired, but darkened for the use of PowerPoint and similar technologies. KM: What are some stained glass innovations that can get us excited about the future of stained glass? RG: Look for more installations combining green energy with stained glass. That’s an area where glass can excel in a way that few other arts can. 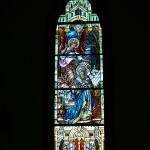 KM: Do you see the DIY stained glass community as competition, or an asset? RG: It’s an entirely different field than the professional studio, and yet many of the people who own studios today and do stained glass professionally started out as hobbyists. It’s a matter of learning the fundamentals of design, fabrication, and art; someone who has the desire and is willing to invest the time can go far. KM: What are the biggest challenges to the professional stained glass world? RG: The biggest challenges are also areas that offer huge opportunity. For example: restoration. There are a large number of fantastic windows in North America that are reaching an age and condition at which they need some work. It’s a new field, here, and much of this country is very different than Europe, where stained glass restoration is more established. It calls for discovering new techniques and adapting those that are already in use so that the windows are preserved in a way that makes sense from an art and craft standpoint and to the owners and stewards of the windows in question. They need to be preserved for future generations; it needs to be done in a way that makes sense. 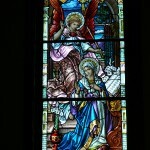 KM: Got any favorite historical stained glass artists and works of art to refer us to? RG: Many. A good starting point is with Charles Connick and John LaFarge. They’re both Americans, and they aren’t very far apart in the time they were creating stained glass. They’re worlds apart in their approach to it. You can really see in their work some of the differing possibilities in stained glass art. It’s exploring that sort of thing that The Stained Glass Quarterly is all about. RG: The coming decades will be very interesting for the art and craft of architectural stained glass. New technologies will continue to make their mark on stained glass, just as they do on every other aspect of our lives. The craft of stained glass – the actual craft techniques used to imagine, design, fabricate, and install – is very solid; new processes will be added, and new tools may change some aspects of the craft, but overall good craft technique is good craft technique. It is the art of stained glass that is the real frontier. Art is very much a human endeavor. It has to be; after all, its purpose is to serve as a means for the communication of often transcendental ideas between persons and even between generations… sometimes across vast spans of time. To remain relevant, stained glass has to speak to today’s viewer in a language that is accessible to him and also carry that message forward in a way that will say to those who come after us who we were, what we believed, and why it mattered. Some of what is being done in stained glass today is amazing; there is a very definite language of stained glass and the future of that language depends to a great deal on what was done in the past. And yet the future is wide open. KM: Alright, we appreciate your time tremendously, Richard. Our website serves our local community and the members of our local ‘space, but our readership is global and we are building relationships with sister ‘spaces around the globe. DIY spaces such as ours are filled with unique varieties of learners and makers of all types, running a gamut of skills, crafts, and materials. This can range from 3D models printed with plastic extruders to electronic inventions, woodwork, metalwork, and beyond. With all this in mind, I have one last request: Issue a simple stained glass DIY challenge to our readers using any theme, any rules, and any materials of your choosing. RG: The SGAA frequently has competitions or design challenges in conjunction with our annual summer conferences. Our next conference, which will take place in Indianapolis in the summer of 2013, has a competition with an open theme; maximum size for the panel is four square feet, with no dimension to exceed 24 inches. Any construction technique is allowed; however, the competition is also a part of Kokomo Opalescent Glass’s 125th anniversary celebration. All glass products used in the panel must be from Kokomo (www.kog.com). This competition is open to everyone; if any of your readers are interested in entering the competition, they can find the complete rules and entry forms at the Stained Glass Association of America’s website: www.stainedglass.org.